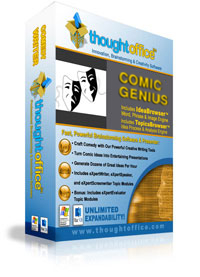 ThoughtOffice Comic Genius is the most innovative software for comic creativity available anywhere. So… crafting comedy is your bit? …but your current content lacks the right punch to knock your audience out? Then maybe it’s time you turbocharged your comedic powers with the ThoughtOffice Comic Genius package. Developed by some of the finest comic writers in the nation, it will help you squeeze every drop of comic juice from that amazing melon of yours. IdeaBrowser – More than 10,985,690 words, phrases, quotes, definitions, and over 3,000,000 keyword-tagged images updated with 12,000 to 15,000 related terms per week to provide always-fresh “funny fuel”. 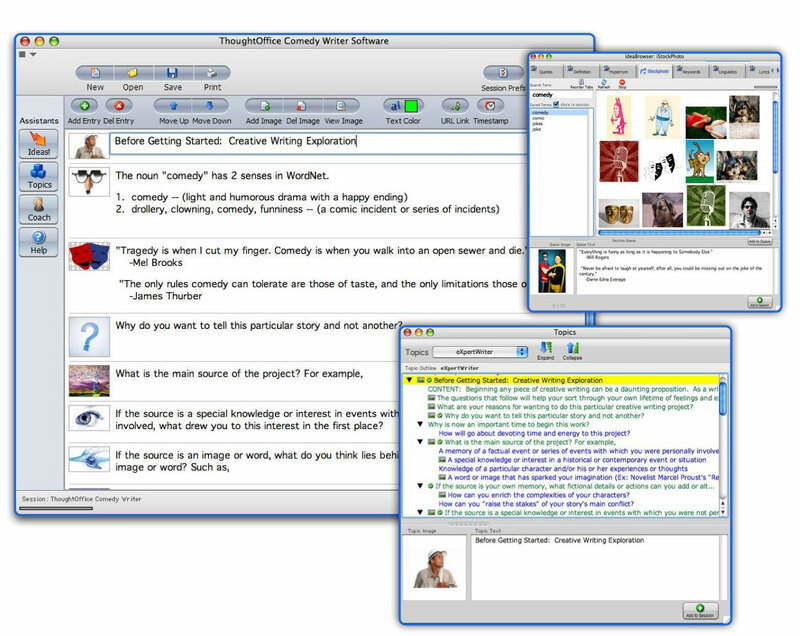 Topics Browser – Thousands of eXpert Questions guide you, help you drill down to “comic gold”. Don’t have one of those “smiles that light up a room”, so you thought you’d use someone else’s? Then maybe it’s time you cranked up your charisma with ThoughtOffice Comic Genius package. What, you ask, does ThoughtOffice, the world-renowned brainstorming tool, have to do with making people smile? 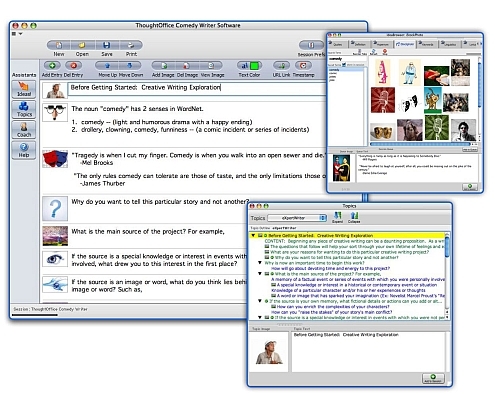 ThoughtOffice was originally crafted specifically FOR comedy (but don’t tell 3M and Apple Computer; they think it’s just a tool their engineers use to make them look brilliant). But I digress. You see, ThoughtOffice is really sorta like a mad science experiment gone awry and you get to create your own Frankenstein in pink. With a tutu (and a tip of the hat to Lloyd Kaufman). So what’s it take to wring the killer comic juice out of your gray matter and funnel it through through the lips or pen? Lets try a few associations. Because, in the end, that’s the root of all comedy: Setting folks up at your comic table, and then opening their eyes to realize that what they’re eating… well, you know, its not pretty. 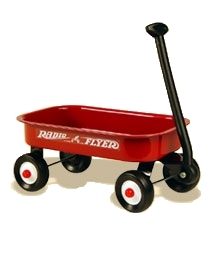 Associations: that series of ideas, thoughts, memories that stream into your noggin when set off by a vaguely familiar trigger… red leads to wagon, and wagon means Radio Flyer. So here’s the deal: we’ve assembled the most popular creative writing tools that top-notch comics use to compose their famous lines (and yes, there are tens of thousands of other comics using ThoughtOffice as well, from Johnny Dam to Drew Carey to, very likely, your last comedy coach). Developing your lines and achieving creative breakthroughs on demand are hallmarks of ThoughtOffice. ThoughtOffice Software: Including the complete 10,985,690 word and phrase Association Engine; IdeaBrowser, integrated with a selection of incredibly useful eXpertTopic modules, targeted for more effective problem solving and brainstorming. eXpertSpeaker Module: Guides you to develop your comic ideas into truly entertaining performances, and provides the tools to present yourself with knowledge, charisma, and confidence. 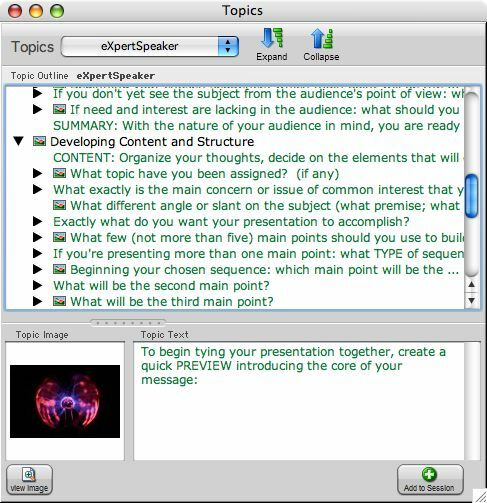 eXpertWriter Module: Helps you to better clarify, enrich and expand on your point of view. ThoughtOffice’s Creative Writing Module also assists you in generating a template to keep your writing cohesive and focused. Add metaphors and colloquialisms that come from ThoughtOffice by the barge-load, and you have a phenomenal, unlimited writing machine for any application, especially comedy. eXpertScreenwriter Module: Facts tell, stories sell. And having an award winning program to assist in creating strong stories around you, your spiel, or your situation is critical to developing an end-to-end performance. This module assists in every element of story development, making it easier to create, and faster to produce compelling stories. Used by thousands of comics and screenwriters the world over to craft some of the most creative and mesmerizing stories ever to hit the stage or screen. So you get killer comic muscle from an award-winning package used by some of the most prolific comics around. Ready to take the plunge into advanced humorosity? Get going with our Expert Comedy Writers package, Comic Genius, and get funny(er) today! ThoughtOffice has a 49-day, 100% guarantee. Your satisfaction totally guaranteed. We’re here to personally help you with the program, and use it effectively to develop lots of great new ideas – faster and more creatively. We’ll help you turn those ideas into comic GOLD, or we’ll update, upgrade, coach or refund to your complete satisfaction.